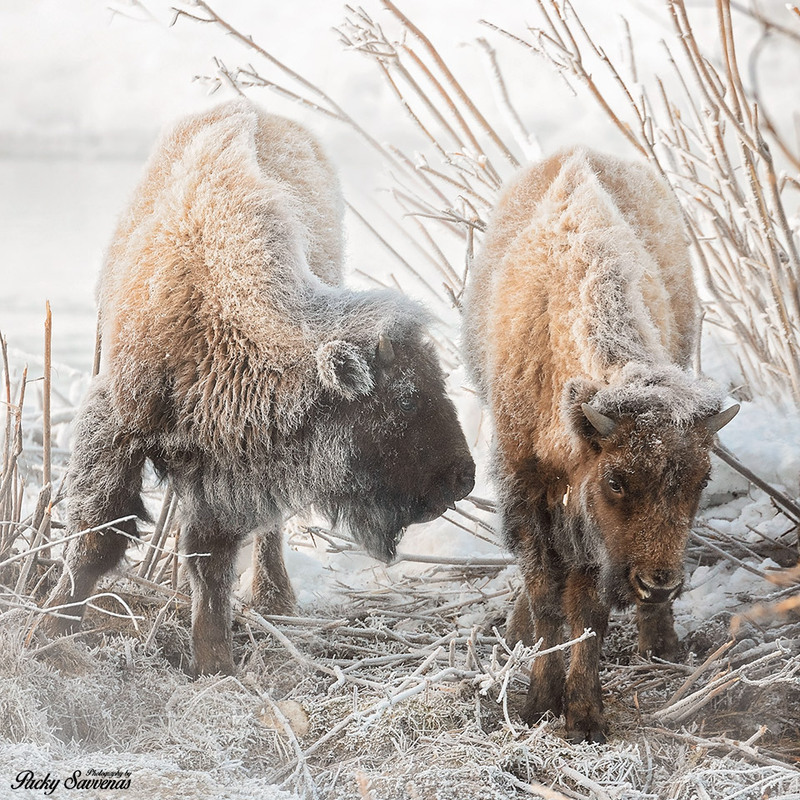 The sun was on the rise, ice crystals glistened on the bison’s frost covered coat. The majestic beast emerged from the steamy bank of the misty creek….. a new day has risen. I knew I had one last chance as the temperatures were rising and the snow was melting. I knew I only had one opportunity to get what we call the “frosty bison”. With temperatures on the rise here in the Grand Tetons, and the snow slightly starting to melt, this was becoming quite the challenge. As I have mentioned in previous posts, this is the spring where I have shot many of my critters that I talk about often in my blog. 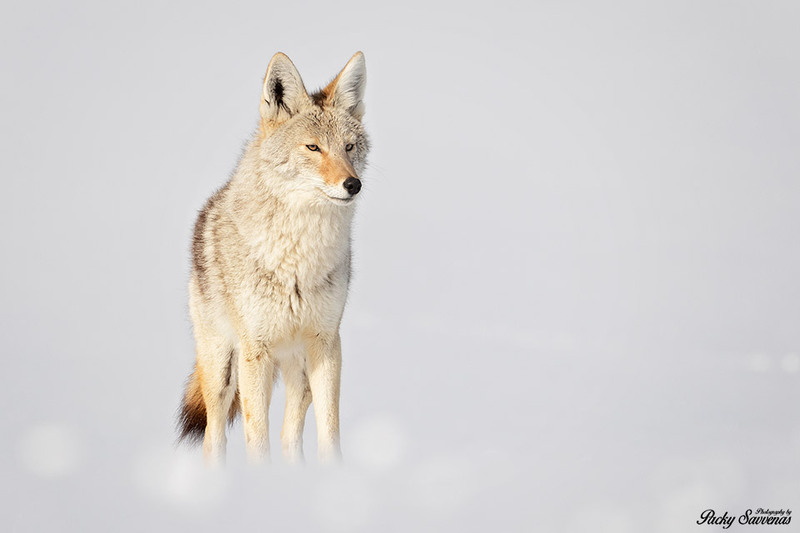 It’s a hotbed for animals to seek refuge from the record amounts of snow we have gathered here in Yellowstone. This spring is a safe harbor for animals due to the fact that it melts the snow around it; providing a great steaming effect! If you read my last post “Where the Wild Things Roam“, I visited this spring right outside of Kelly and was able to capture some amazing pictures of bison during the day. I’ve seen so many pictures on social media, blogs and magazines of the famous frosty bison. Then it hit me; the spring’s mist could attach to the bison if it were cold enough and windy enough. So, I spent the whole week getting there as early as I could in the morning prior to the sun coming up. I was hoping the mist from the river would gather on the beautiful fur coats of the bison so I would be able to pull off a frosty bison shot. The problem was the temperature has been on the rise and all of a sudden Spring has hit. Every morning I would get out there and it would be somewhere close to 20-29 degrees. So, instead of photographing frosty bison, I would drive around looking for other specimens to photograph. Today though I got really lucky. The temperature was at least 0 degrees and there was a wind chill factor of probably -15. I arrived at my usual time about 30 minutes before the sun rose. As I waited in anticipation I could see that the bison closer to the spring just happened to be covered in frost. It was so cold that after taking pictures of these frozen bison, I myself was frozen to the bone. During the cold winter season, bison develop thick, woolly coats that help protect them from freezing temperatures and harsh winds. 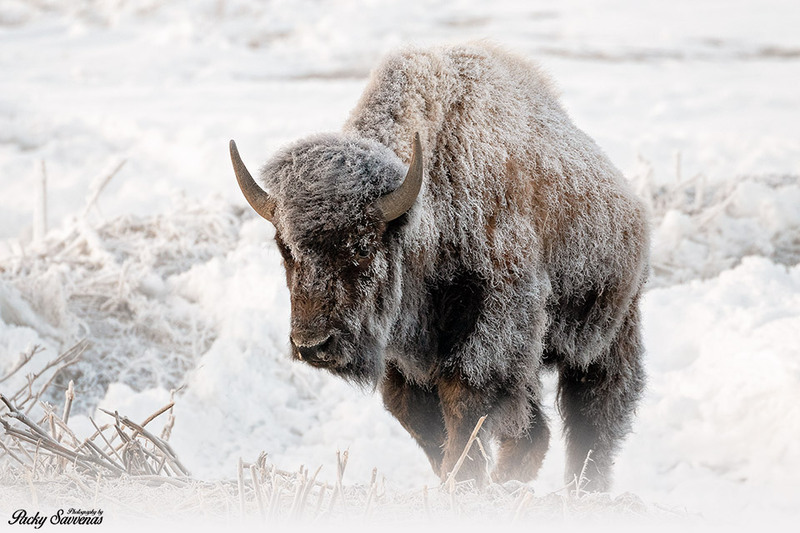 It is said that a bison’s winter coat is so thick and provides insulation so effective that when snow accumulates on its coat, it will not melt from the heat of the bison’s skin. This was my lucky day indeed. I was able to pull off some excellent shots as the sun started to rise among the Grand Tetons. I was able to capture a whole family of bison that have been taking refuge at the spring through this harsh winter season. With Spring approaching, I really think this was my last chance to get a frosty bison. I am just happy that I am able to provide these pictures for you guys to see. Don’t forget I provide Wildlife lessons in photography right here in the Grand Tetons. All you need to do is look up greekmountainman.com!